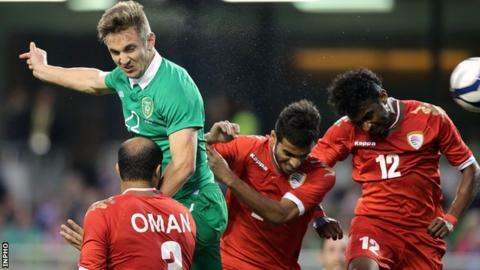 The Republic of Ireland warmed up for Sunday's opening European Championship qualifier in Georgia with a comfortable 2-0 friendly win over Oman in Dublin. Kevin Doyle headed in the opener from Robbie Brady's corner and David Meyler hit a post as the Irish took control in the first half. Aiden McGeady saw his shot cleared off the line before Alex Pearce fired low into the net on 81 minutes. Everton winger McGeady clipped the Oman bar in the dying seconds. Keeper Shay Given was handed his first Republic start after coming out of international retirement while Darron Gibson made his return from a serious knee injury. An experimental Ireland line-up took time to settle in front of a sparse Aviva Stadium crowd of 14,376, but they took command after Mohammed Al-Siyabi curled just wide for Oman. Brady's shot was blocked and Stephen Quinn volleyed wide before Doyle found the net on 20 minutes. Brady supplied a pinpoint inswinging corner and the striker rose highest at the near post to glance his header past Wigan keeper Ali Al-Habsi. The hosts pressed for a second goal and Pearce saw his header, from another Brady corner, cleared off the line by Hussain Al Ghailani. Meyler was denied by the woodwork after 36 minutes with the defender's deft chip from 20 yards hitting a post. The pace slackened in the second half with the game becoming disjointed after both teams made numerous substitutions. McGeady, who was introduced on the hour mark along with Robbie Keane and Shane Long, came close to doubling the lead. The Everton winger dragged inside but Mohammad Al Musalami was perfectly placed to clear his goal-bound shot off the line. Pearce headed wide from a corner before sealing victory for the Republic on 81 minutes - the ball broke to the Reading defender 14 yards out and his low strike sneaked inside the post. McGeady missed out again a minute from time when his curling shot skimmed off the top of the Oman crossbar. In the end, it was a comfortable win for the hosts ahead of a tough weekend assignment, however the Republic will go into the Tbilisi qualifier without James McClean after the Wigan winger pulled out of the squad because of injury. Match ends, Republic of Ireland 2, Oman 0. Second Half ends, Republic of Ireland 2, Oman 0. Corner, Oman. Conceded by Glenn Whelan. Attempt missed. Hussain Al-Hadhri (Oman) right footed shot from outside the box is high and wide to the right. Assisted by Yaqoob Al-Qasmi. Hand ball by Glenn Whelan (Republic of Ireland). Aiden McGeady (Republic of Ireland) hits the bar with a right footed shot from the left side of the box. Corner, Republic of Ireland. Conceded by Jaber Al-Owaisi. Foul by Robbie Keane (Republic of Ireland). Abdul Aziz Al-Muqbali (Oman) wins a free kick in the attacking half. Substitution, Oman. Mohamed Al-Maashari replaces Raed Ibrahim Saleh. Attempt saved. Robbie Keane (Republic of Ireland) left footed shot from outside the box is saved in the centre of the goal. Assisted by Richard Keogh. Substitution, Republic of Ireland. Daryl Murphy replaces David Meyler. Shane Long (Republic of Ireland) wins a free kick in the attacking half. Foul by Ali Al-Jabri (Oman). Foul by Stephen Quinn (Republic of Ireland). Ali Al-Jabri (Oman) wins a free kick in the defensive half. Attempt missed. Robbie Keane (Republic of Ireland) right footed shot from the centre of the box misses to the right. Assisted by Aiden McGeady. Goal! Republic of Ireland 2, Oman 0. Alex Pearce (Republic of Ireland) left footed shot from the centre of the box to the bottom left corner. Assisted by Richard Keogh following a corner. Substitution, Oman. Abdul Aziz Al-Muqbali replaces Eid Mohammed because of an injury. Delay in match Eid Mohammed (Oman) because of an injury. Corner, Republic of Ireland. Conceded by Saad Suhail Al-Mukhaini. Substitution, Oman. Hussain Al-Hadhri replaces Mohammed Al Seyabi. Saad Suhail Al-Mukhaini (Oman) wins a free kick in the defensive half. Attempt missed. Robbie Brady (Republic of Ireland) left footed shot from outside the box is just a bit too high from a direct free kick. Foul by Jaber Al-Owaisi (Oman). Attempt missed. Alex Pearce (Republic of Ireland) header from the centre of the box misses to the right. Assisted by Aiden McGeady with a cross following a corner. Substitution, Republic of Ireland. Glenn Whelan replaces Darron Gibson. Darron Gibson (Republic of Ireland) is shown the yellow card for a bad foul. Foul by Darron Gibson (Republic of Ireland). Eid Mohammed (Oman) wins a free kick in the defensive half. Corner, Republic of Ireland. Conceded by Ali Al-Busaidi. Attempt blocked. Aiden McGeady (Republic of Ireland) left footed shot from the right side of the box is blocked. Stephen Quinn (Republic of Ireland) wins a free kick in the attacking half. Foul by Eid Mohammed (Oman).